Introducing the Rick's Motorsport Electrics regulator rectifier for Harley Davidson® motorcycles. This aftermarket Harley Davidson® Regulator Rectifier has been built with ceramic hybrid technology. It's a perfect solution for replacing your bike's OEM regulator rectifier. Save up to 50% from the cost of the OEM Harley Davidson® part and improve your bike's electrical system performance. Great part, used it to replace the regulator rectifier on my Harley Road King. Would recommend this part to anyone making a replacement. This is the way to go if you are replacing your Harley rectifier regulator. It costs less than the OEM and comparable aftermarket regulator rectifiers sold on Amazon. Plus, you can't beat free shipping! I looked a bunch of sites before deciding where to order a new regulator rectifier from. Needed to replace the piece on my Harley, and I needed to find a good deal. One thing I like about Rick's is that I'm ordering straight from the maker, not from a retailer. That means I'm skipping the "retail markup". The park installed easily, and it's clearly a well engineer high quality piece. 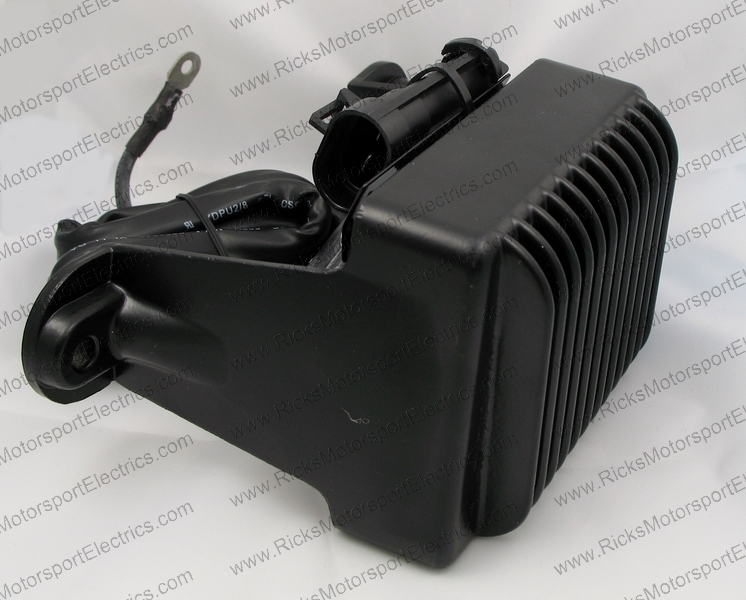 Rick's Motorsport Electrics has been producing high quality OEM style Regulator Rectifiers motorcycles for over 30 years. OEM style aftermarket rectifier-regulator, priced below OE. All Rick's Regulator Rectifiers come with a one year replacement warranty. Call us at 603-329-9901 to if you have any specific questions about our Regulator Rectifier. We back our Regulator Rectifiers with a one year warranty. When replacing your Harley Davidson® Regulator Rectifier always check the connectors and wires for damage/corrosion from overheating issues. Any products with the trademark, name, word, or OEM part number used on this website by Rick’s Motorsport Electrics, Inc. is intended to be as a reference only to the usage of that particular product. None of the parts on this website were manufactured by or with the permission of the Harley Davidson® Motor Co.
BAD BOY, BADLANDER, BUELL, CLASSIC, CONVERTIBLE, CROSSBONES, DEUCE, DUO GLIDE, DYNA, DYNA GLIDE, DYNA WIDE GLIDE, ELECTRA GLIDE, EVOLUTION, FAT BOB, FAT BOY, FAT HEAD, FORTY-EIGHT, HARLEY, HARLEY-DAVIDSON, HD, H-D, H-D HERITAGE SOFTAIL, HERITAGE SPRINGER, HYDRA GLIDE, HUGGER, IRON 883, LIGHTNING, LOW RIDER, NIGHTSTER, NIGHT ROD, NIGHT TRAIN, REVOLUTION, ROCKER, ROCKERTAIL, ROAD GLIDE, ROAD KING, SOFTAIL, SPORTSTER, SPRINGER, STREET BOB, STREET GLIDE, STREET ROD, SUPERLOW, SUPER GLIDE, T-SPORT, THUNDERBOLT, TRI GLIDE, TWIN CAM, TWIN CAM 88, TWIN CAM 88B, TWIN CAM 96, TWIN CAM 96B, TWIN CAM 103, TWIN CAM 103B, TWIN CAM 110, TWIN CAM 110B, ULTRA CLASSIC, ULYSSES, V-FIRE III, V-ROD, V-ROD MUSCLE, VRSC AND WIDE GLIDE ARE REGISTERED TRADEMARKS OF THE HARLEY-DAVIDSON MOTOR COMPANY, INC., MILWAUKEE, WI, U.S.A.